One of the two PNP Highway Patrol Group (HPG) members involved in the killing of a motorcyle rider has committed suicide in Camp Crame. 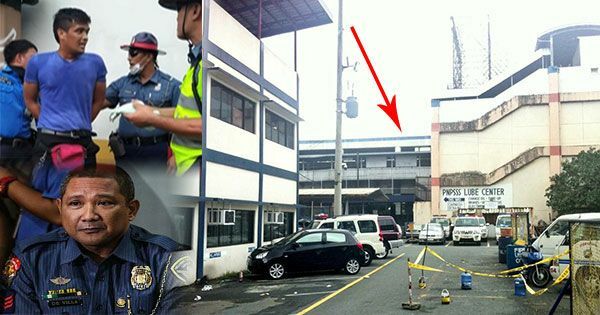 Police Officer 3 Jeremiah De Villa jumped to his death from the rooftop of the PNP-HPG headquarters at around 9 a.m. on Saturday, August 27, PNP-HPG commander Senior Supt. Antonio Gardiola Jr. said. De Villa, who was facing charges along with fellow HPG member PO2 Jonjie Manon-og over the death of John dela Riarte, whom they arrested after engaging in an altercation with a car driver in Makati City last July, was brought to the PNP General Hospital where he was pronounced dead at 9:45 in the morning. Both De Villa and Manon-og have been recommended for summary dismissal proceedings. Aside from the administrative case, they were also charged for robbery and murder. In a radio interview, Gardiola confirmed that De Villa took his own life, ruling out foul play. He clarified that De Villa was allowed to roam the camp as he was only under "restrictive custody" and not "in detention." An investigation into the suicide found only one set of footprints on the roof where De Villa's slippers and cellphone were recovered. PO3 Joaquin Rafael Florendo, who investigated the incident, said he believes that De Villa "was suffering from low morale" because of the cases against him. Meanwhile, De Villa's private lawyer Atty. Maritoni Renee Resurreccion said the late HPG member "kept saying sorry" for everything. "We know he's really troubled because of the negative publicity that he feels is affecting the reputation of his family and the PNP," she said. "I'm convinced he was sorry that he performed his lawful duty and as a consequence someone died." De Villa suffered from depression because his mother, who got affected by stress amid the controversy, died recently, Gardiola added.